The unveiling of the new Apple iPad earlier this week has a lot of people excited. Nintendo president Satoru Iwata is not one of them. 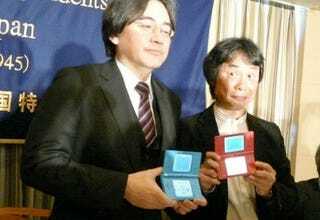 "It was a bigger iPod Touch", Iwata told Associated Press, adding that the new device offered "no surprises". The Nintendo president was equally down on the recent enthusiasm over 3D technology, saying "I have doubts whether people will be wearing glasses to play games at home. How is that going to look to other people?". Iwata also said Nintendo would need to look into the "possible health effects" of playing games in 3D for prolonged periods of time. I don't know. How does shouting/blowing into a handheld on the train make you look? His buzz-killing didn't stop there, either, responding to questions about motion-sensing handhelds and high definition Wiis with "I question whether those features would be enough to get people to buy new machines". Nintendo: CEO&apos;s Comments On DS Successor Were "Misinterpreted"
Course not. Not like they're redesigning the case, adding a camera or just making it bigger, are they?